Bill’s favorite places to shop for outdoor gear sales and photography gear sales. Through the stores below you’ll find everything from photography gear deals to outdoor gear deals including all the little accessories and gadgets that you’ll be seeking out along with the staples like camera bodies and lenses. Happy shopping!!! __________________________________________________________________________ Quickly Build a Pro Photo Website like COOLWildlife and COOLLandscape from scratch. 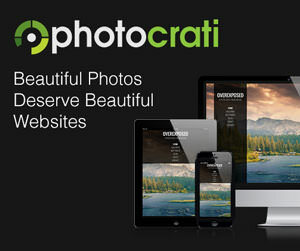 I researched the many offerings and for $89 you can’t go wrong with Photocrati. Their support is amazing and I had my site up and running in a matter of hours with very little help. quickly so if you have questions do not hesitate to email or call them. Cool Photography Gear: Exclusive Canadian dealer for Heat3 Smart gloves and they offer an affiliate program for anyone who is interested. They offer significant savings on Jobu Design tripods and gimbal heads. B&H Photo: Everything photography best describes B&H. Camera’s, lenses, tripods and most main stay accessories. If it is a piece of photography gear you will find it at B&H. Canadian shoppers will want to price compare with Henry’s or Vistek as I am finding that B&H has better prices on most items despite the customs and duties charges. Jobu Design: There are significant savings to be had on Jobu Design tripods and gimbal heads at Cool Photography Gear. For the money these Canadian made gimbal heads are the best you can buy. If you own a 300mm or longer lens you really should be seriously considering a gimbal head to mount your lens to your tripod. Save some bucks over the Wimberley brand and go with Jobu they are rock solid and every bit as good. Under Armour Canada: Known for the most innovative sports clothing, athletic shoes and accessories on the market. This brand has really caught on with athletes and outdoor types in Canada. Free shipping, all orders, no minimum. Amazon USA : Needs little introduction suffice it to say Amazon.com is a one stop shop for most everything. You’ll find books, video, software, electronics, camera gear, outdoor gear and the list goes on. Amazon Canada : The same as Amazon USA only preferred place for Canadians to shop in CDN currency with no customs and duties as would be paid through Amazon USA. Chapters Indigo Canada Canadians buy bestsellers and bargains at Chapters Indigo, Canada’s biggest bookstores with locations across the country including Toronto, Halifax, Montreal, Ottawa and more.